I just updated to Sierra 10.12.1 and now some VST windows aren’t working in Renoise 3.1. Sugar Bytes’ Obscurium’s window will open, but show no graphical display. Same thing with Rob Papen’s Punch. Phonec 2 from Psychic Modulation won’t open at all. All three work in Cubase Elements 9 (the reason I updated to Sierra). I’ve tried rescanning, and also deleting and reloading the VST from the instrument slot. Even tried rebooting the system. Would like to get these functional in Renoise again. See photo in post below that shows blank VST window. Also, I tried the AU version (forgot you can activate them in Renoise) and they work. I just updated to Sierra 10.12.1 and now some VSTs windows aren’t working in Renoise 3.1. Try to save everything you need to keep, and then uninstall Renoise and install again, without reinstalling any VSTs.Maybe this way the VSTs reappear, although I do not think it’s the cause. However, it is possible that the problem is of the VST registry itself in the operating system, and has nothing to do with Renoise. It is very possible.The solution is to re-register the VSTs (no need to uninstall, only register).If in the end all this does not work, uninstall and install the VSTs again. When you install a new operating system version, the system can clean part of the registry of some programs (the VSTs) and it is necessary to register them again (the key). Thanks for the reply, unfortunately none of those worked. Here’s a screenshot, in case that helps. Maybe Renoise is just jealous that I’ve added Cubase? Seriously though, I’d like to get Renoise functional again with these VSTs! The screenshot shows Obscurium on the left and Punch on the right, and as I say Phonec 2 doesn’t open at all. Are you using an hackintosh or a real mac? Just asking, because on hackintosh, if your gfx driver/kext wasn’t injected properly, it simply could be disabled and the software gfx driver is running. Then it could happen that all opengl driven guis will not work. Also this looks more like a problem of the plugin vendors, are you sure they announced Sierra compatibility? It’s a Mac mini, late 2014 model, and as noted in the first post all three VSTs work fine in Cubase Elements 9. Ups, sorry. Out of ideas then. Did you check if Cub 9 uses the VST3 versions? If so, you could deactivate VST3 in Cub9 and use the VST2 versions just like in Renoise and see, if that also works in Cub or not. There’s no VST3 version for the plug-ins not working. However, this reminded me that there is the AU version. Just tried it, and they work! Thread title updated. I still wonder about the VST versions though, and think the Renosie team should probably look into this. Updated to Sierra 10.12.2 thinking it might fix the issue, ends up wiping out my entire display: just a cursor on a black screen. Apple Support was no help, denying it was an issue, even with others reporting it on various forums. Ended up having to erase my HD and install from scratch. FFS Apple, get your sh!t together. Edit: And no the fresh OS install didn’t fix this VST issue. 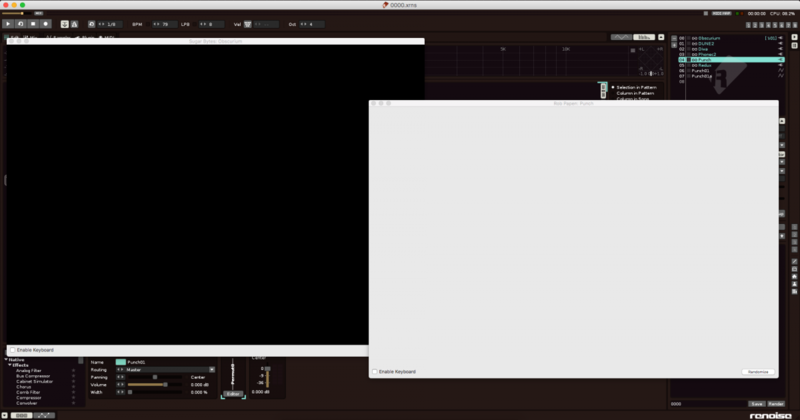 Actually got an error message when trying a PSP Audioware EQ demo, and yes still a blank window. I’m up to Sierra 10.12.3 at this point. Between this, MicroTonic MIDI routing not working, and Korg Wavestation VST constantly crashing (unrelated to Renoise) I’ve been having a ton of fun with bugs! Sorry to revive an old thread, but I’m having exactly the same problems with Renoise 3.1.1 64-bit on macOS 10.13.6, using a mid-2012 MacBook Pro. It’s the PSP Audioware effects VSTs I’m having the most trouble with, although the Korg M1 VSTi won’t even instantiate either. The AU versions of them work fine, but I need the VSTs to work so I can make my projects work on both Mac & Windows. PSP Xenon 1.5.2 doesn’t crash, it just displays a blank GUI window (just like in @grape_ape’s 7122 screenshot), so it might be a good starting point for debugging. I also get the same crash as @grape_ape with NobleQex (ie a crash in ‘Dispatch’, Thread ‘GUI’), as do most of the PSP effects plugins. However a few PSP plugins seem fine, like PSP FETpressor and PSP NobleQ. I’d assume the problem is with PSP’s code and ask them, but the VSTs seem to work okay in Ableton 9 Lite, so I thought I’d try asking the Renoise crew first. EDIT: I’m also having problems with the VST version of Flux Stereo Tool v1 now, it doesn’t display a GUI in Renoise either. And the PSP VSTs work in Reaper & Ableton 9, so it does seem like a Renoise issue.